When I first bought the red skirt, I didn’t own many red items of clothing. I didn’t own any pencil skirts, and not many items of form-fitting clothing either. I bought the skirt when I was nearly a year into recovery. Although I had gained weight in recovery, my body image had also improved, and as a result, I began to wear crop tops and bikinis. For some reason, however, form-fitting clothing was still a fear. Despite this, I bought the skirt. The first time I tried it on, I wished I had gone a size up. I felt like I could not hide my body at all. Every “curve” was visible; I felt vulnerable. I felt fat. I wore the skirt on Christmas (2016) anyway. I wore it with a sequined crop top, which was even scarier for me, but I felt confident. Recovery had given me a sort of confidence; it had taught me that even as a disabled woman, I was more than my body, but even so, I was allowed to feel comfortable in my body no matter its shape or size. A year later, I am nowhere near as confident as I was then. I relapsed with my eating disorder last semester, and even though I lost weight, my body dysmorphia is stronger than ever. I began wearing looser clothing to hide my “imperfections” and “fat.” Although I was smaller, I felt huge. I still do. On Christmas Eve, however, I decided to wear the red skirt. Admittedly I immediately changed out of it, but eventually, I worked up the nerve to wear it for Christmas Eve dessert. At this point, I had been home from school for a little over a week, and being back on a structured meal plan was making me feel disgusting as if I was gaining an absurd amount of weight. This is all a part of body dysmorphia–feeling as though I am gaining weight rapidly, but it is also a part of recovery. I spent months abusing my body, and now it is learning to digest and metabolize food properly again. It is normal for my body to retain fluid and for my digestion to be slower; this is what my treatment team told me. These factors combined made wearing the red skirt all the more terrifying. I was scared I would look bloated or fat or “out of control,” but most notably, I did not feel like I deserved to feel good about my body; and wearing form-fitting clothing, in my mind, signified that I was feeling good about my body. My eating disorder tells me I do not deserve to feel good about myself unless I am one hundred percent perfect. My eating disorder’s definition of perfect is starvation and exercising to the point of exhaustion (my ED also wouldn’t mind a 4.0 GPA and a perfectly organized and executed social life, but its number one priority is that I eat as little as possible, purge what little food I eat, and stay as thin as possible). This, of course, means I am never allowed to be happy. When I am not starving, I am guilty, and when I am, I feel hungry, tired, and miserable. 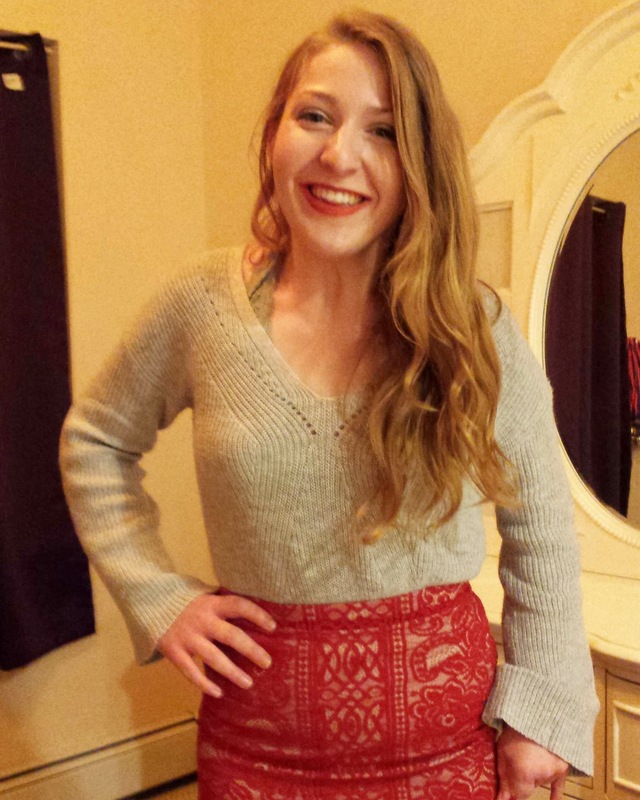 This Christmas Eve, I defied my eating disorder by eating dessert, drinking wine, and wearing a tight skirt. Yes, I struggled with my body image. I even cried over it. Yes, I felt guilty and fat and undeserving of food. But it felt pretty damn good to defy the monster that has been controlling my life for the past few months.